Careers with Cats: how can I become a Veterinary Nurse? If you’re interested in a career with cats, you might be surprised to learn that there are a variety of roles working specifically with felines. In our blog series so far, we’ve been focusing on a range of cat-based careers – from working as a Cat Care Assistant to becoming a Cat Behaviourist. 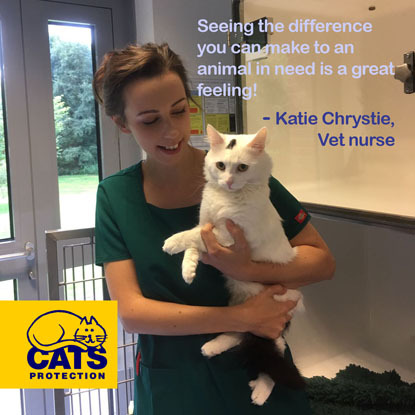 The latest post in our series is all about Katie, who works as a veterinary nurse. What inspired you to become a veterinary nurse? I have always loved animals so from a young age I knew I wanted to become a veterinary nurse and have a career working for animals. I qualified as a veterinary nurse in 2003. Back then, to train as a veterinary nurse I had to enrol as a student veterinary nurse with the Royal College of Veterinary Surgeons (RCVS), attend college-based study for two years while being employed by a veterinary practice to gain practical experience. How did you become a veterinary nurse? What do you love most about being a veterinary nurse? I love being a veterinary nurse as it is a challenging job that requires lots of different skills. The best thing about my job is being able to work with animals every day, and every day is different. Seeing the difference you can make to an animal in need is a great feeling! Being able to work as part of a team and provide the nursing care and attention to enable a poorly pet to go home happy and healthy makes the job so rewarding. Find out more about becoming a Cat Care Assistant by meeting Avril here, meet Sarah and discover what life is like as a Veterinary Surgeon here or discover what it takes to become a Cat Behaviourist by meeting Dom here. Cats Protection are really helpful!